In recognition of Breast Cancer Awareness Month, Ella Health is making it easier for women to feel their best with “Just One.” Instead of getting overwhelmed with trying to make too many changes at once, just take one step at a time. Get one mammogram a year and do one breast self-exam a month. This is a simple guide to help you understand how your breast health at any age. As you get older, you may notice that your breasts change shape and size. But they are undergoing significant changes beyond the need for a better fitting bra. Their composition actually changes along with your risk of breast cancer and other health concerns. The more you know about what’s happening, the better you can take care of yourself. At this stage of life, breasts are at their most dense with a high amount of fibrous tissue compared to fat. The risk of breast cancer is also at its lowest, although 1 in 220 women will be diagnosed with breast cancer between ages and 30 and 39, according to the National Cancer Institute. It is important even at this age to be aware of what your breasts look and feel like so you will notice if there are changes that could indicate a problem. You should start doing regular monthly breast self-exams in your 20s. At this age, rising progesterone levels around your period can make breasts feel tender and swollen. The most common problem in the 30s is general breast pain due to fibrocystic breasts, a generic term for tender lumpiness due to hormonal changes not related to cancer. Because of the low risk for cancer and the density of breasts at this age, a mammogram is recommended only if there is a particular risk factor such as a family history of breast and ovarian cancer. This is the beginning of the biggest changes in your breasts. 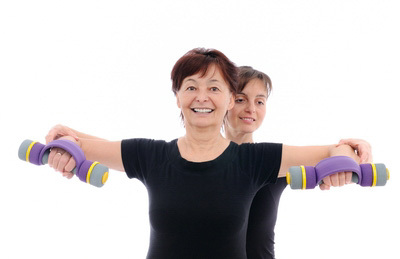 With the hormone changes of perimenopause and menopause, fibrous tissue is replaced with fatty tissue. The risk of breast cancer increases to 1 in 69. As breasts become less dense, you may feel a lumpiness that you didn’t notice before. The most common concern during this time is breast cysts, fluid-filled sacs that aren’t cancerous but can be painful. They can be drained or surgically removed and do not affect your cancer risk. Cancers found in women in their 40s tend to be more aggressive. The earlier they are found, the more easily they can be treated. Women should start getting annual mammograms at age 40. The changes in breast composition continue and some women notice shrinkage. The risk of cancer increases to 1 of 38. Leading up to menopause, women may find a thickened, rubbery area due to fibrous tissue or lumps due to fluid-filled cysts. This often subsides after menopause. Our skin often gets drier all over and the sensitive skin on our breasts may suffer more. You may experience itching or sensitivity to products that weren’t a problem before. It is easier to find cancers because there is less dense tissue that makes them more difficult to identify. Cancers discovered at this age tend to be slower growing and more likely to be estrogen receptor positive, which means more drugs are available. The major changes are over. The risk of cancer increases to 1 in 27 from age 60 to 70. It is easier to detect breast cancer at this age and annual mammograms continue to be an important part of monitoring breast health, along with monthly breast self-exams. If you notice something of concern, consult your doctor. Make your health your priority. 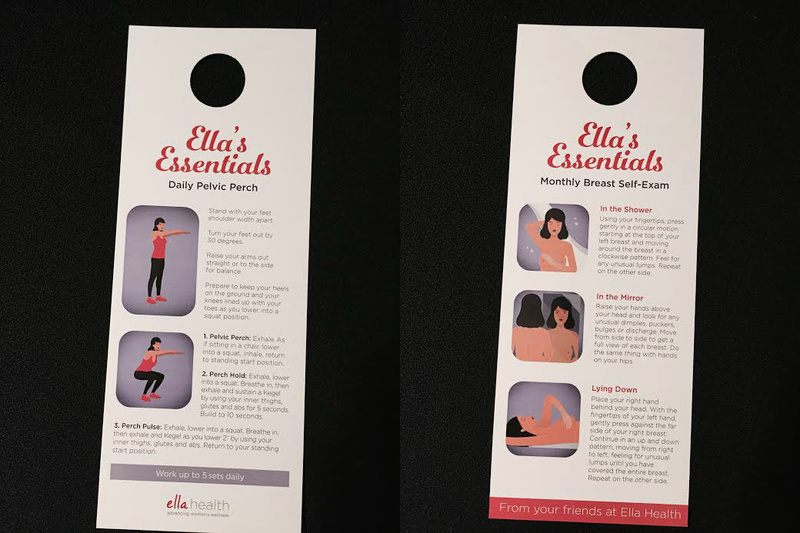 Come to an Ella Health Center and get an Ella Essentials card as a reminder to do a daily set of squats and a monthly breast exam.